In the Gospels, Jesus is on the road to Jerusalem – the road to crucifixion and along the way Peter rebukes Jesus for talking about crucifixion, James and John argue about who is going to be the most important in the new Kingdom of God and the other disciples spend their time planning and dreaming about the power, wealth and glory that they think will be theirs when Jesus finally takes over. In the midst of this Jesus turns to them and says: “Whoever wants to be first must be last of all and servant of all.” (Mark 9:35) and “If any want to become my followers, let them deny themselves and take up their cross daily and follow me. For those who want to save their life will lose it, and those who lose their life for my sake will save it.” (Luke 9:23-24) We are like the disciples – all of us striving to be Goliath, striving to turn Jesus into Goliath. What is required of us are Five Smooth Stones to help us recognize who we are as God’s children, and how we should relate to the world and to others. Stone #1 – Know the world. David was a shepherd. He learned to deal with the world through being a shepherd. This was hard work; it was dangerous and dirty work. But it taught David the skills he needed and he learned about living in the world. We too have a wealth of experiences that should help us to learn to live in this world. No experience is worthless, we can learn from everything. And God continues to give us all kinds of experiences to help us to continue to learn and grow. None of us ever get to the point where we can say we know everything we need to know. Stone #2 – Know your community. David was brought up in a family in the town of Bethlehem that is of the Tribe of Judah, which is of the nation of Israel. David was strongly connected to his roots, and this gave him strength and confidence. We live in a world that devalues community, and celebrates the individual. But yet, community is one of God’s great gifts to us, and separated from community we will spiritually languish. Steeleville is one dimension of the community that is a part of our lives, also our families. But also, importantly, so too is our church community – Peace and the Wartburg Parish are also a gift. Are we grounded by regular participation in Word and Sacrament? In what ways do we participate in the broader community? Stone #3 – Know yourself. King Saul tried to dress David in his own armor for battle. But David had enough self-knowledge and self-assurance to say, no this is not me, and I cannot fight like this. If David had gone into the field with that armor on he would have lost! How many times do others try to dress us in their armor or try to make us into something or someone we are not? Do we know ourselves well enough to say – No! This is who I am and what I need to do! Stone #4 – Know God – Goliath is not God. That seems self evident, but it really isn’t. We like to try to re-create God in our own image and we do it all of the time. Consider this quote from Duke Divinity School’s Dr. Samuel Wells: “Let me tell you another tragedy of this story. How has it happened that Christians in this country have lost so much of the respect and trust of people of other faiths and of no expressed faith? I’ll tell you how it has happened. It has happened by Christians turning Jesus into Goliath. And that’s a tragedy. Jesus is not a cosmic or political or cultural bully. Jesus is not Goliath. Whatever your view of truth -- faith or no faith -- Goliath is not God. David knows that. David knows where the secret of the universe lies, and it’s not with Goliath.” Through Word and Sacrament, through prayer and study we need to always be in touch with the God who calls us to humbly follow him so that his love, grace and forgiveness might flow through us. Stone #5 – Trust in God. 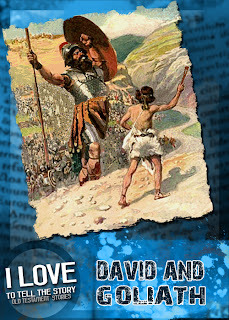 David is faithful. David trusts in God. No matter how selfish David is, no matter how many mistakes he makes he always has a sense that God is with him and is there ready to forgive him and strengthen him for service. So to with us – we are called to trust in the Lord and be open to God’s forgiveness and to be faithful to God’s call. Note – I did not use the word “faith” which is a noun. I used a verb – “trust.” For what we are called to is an active faith. A faith that like David, calls on us to act in love and courage and trust daily reaching out in God’s love to others.